The coast-line of Ulcinj is 32.70km long, spreading out from Stari Ulcinj Cape to the mouth of the Bojana river into the Adriatic Sea. There are 18 inlets in the cliff part, the peninsulas Marjan and Mandra, Valdanos Beach, two sandy beaches-Velika Plaža and Mala Plaža. A special attraction is a natural reservation Ada Bojana on this part of the coast. The Great and Small Beaches, Ada Bojana, Valdanos and the beaches along the pine forest are distinctive for its beauty, size and environment. 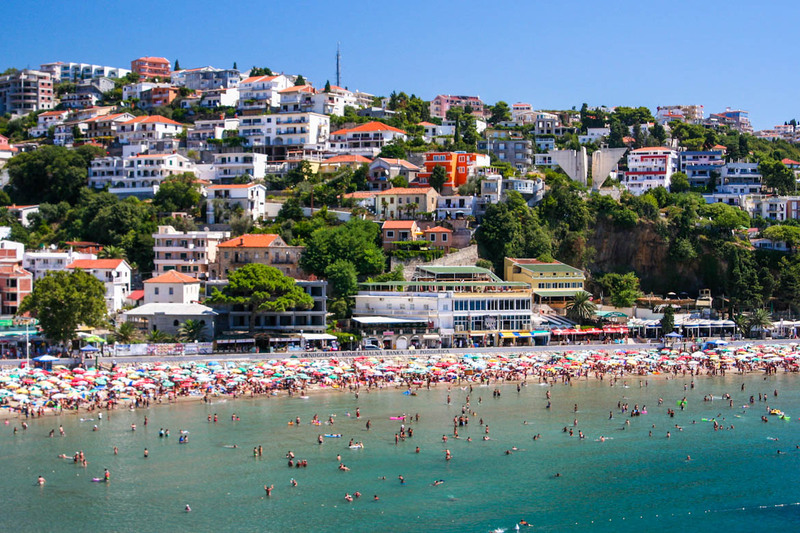 The Ulcinj beaches are very sunny with a lot of subtropical vegetation. Owing to the configuration of the beach, Ulcinj riviera has great possibilities for organizing sports on the beach and water. 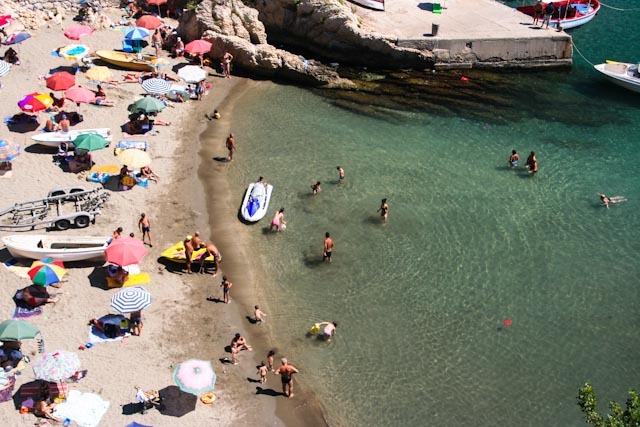 The Valdanos beach together with its background is a true olive reservation. It is covered with big pebbles as well as the sea bottom and in a mild semicircle it is pulled into the land. There is a tourist settlement of bungalows surrounded by olive trees, as well as a restaurant in its background. There is also a campsite but not a very big one. The beach is 400 meter long, and on its endings there are cliffs, distributed like vines what is a dream of every fisherman, diver and a researcher of sea depths. The sea is clean, dark green. The inlet winds are convenient for sailing. Best accommodation in close proximity to the Valdanos plaža beach. Apartments Eman Resort – Apartments Eman Resort is situated in Ulcinj, 1.5 kilometer from the Old Town of Ulcinj. It offers free Wi-Fi. Some units have a seating and / or dining area. The apartment also has a terrace. Guests can go diving or fishing and the property offers car rental services. Location – Valdanos, 1.5 km from the city center of Ulcinj. Facilities : Free Wi-Fi Internet, Free Parking, Terrace, Garden, Room Service, Car Hire, Ironing Service, Dry Cleaning, Laundry (surcharge), Airport Shuttle (surcharge), Car Rental, Pets Allowed. This is a city beach with a sandy strand. The sand is fine, of high quality and the sea bottom is sandy too, because of what the color of the water is dark green-blue. This beach is distinctive for the shallow bottom which goes far into the sea. That’s why it is very convenient for children. 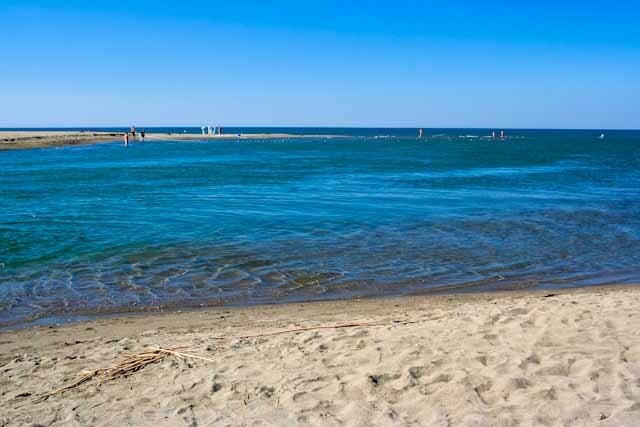 The Gradska Plaza beach is 360 meter long and its capacity is 2500 people. At the very end of the beach, beneath the Old Town, the walls of which as if emerging directly from the sea, is a small Ulcinj port, with a well managed pier. In its background there are restaurants, beer bars, cafes, and towards the inside is the town Ulcinj-the most south spot of the Montenegrin coast-line. Ulcinj is built in sea-oriental style. Along the pine forest, between the hotels Galeb and Albatros, is a succession of small natural and hotel beaches: Skalic, Birici, Ludvig’s beach, Zenska beach. Further, there are pebbly and rocky beaches for those who want mysterious and quiet spot in a perfect natural environment: Maslinjak, Opaljice, Dzemina Beach, Ljana, Crnogorsko guvno. In front of these beaches there are terrains convenient for underwater fishing. Best accommodation in close proximity to the Gradska plaža beach. Hotel Senator – This property is a 2-minute walk from the beach. Hotel Senator is 500 meters from the beach and 1 km from the center of Ulcinj. It offers free Wi-Fi and a private garage. The hotel has an indoor and outdoor swimming pool, as well as the possibility to rent a car or bicycle. All accommodation units are air-conditioned and equipped with a seating area with a flat-screen TV and DVD player. There is also a kitchenette with a dining area. The private bathroom has a shower and a hairdryer. The hotel bar has a summer terrace. Massages are also available for an extra charge. There is a supermarket 50 meters away, and a restaurant serving local and international cuisine 100 meters away. Location – Ulcinj, the city center. Facilities : Free Wi-Fi, Free Parking, Terrace, Garden, Sauna, Massage (surcharge), Swimming pool, Wake-up service, Ironing Facilities, Car Hire, Bicycle Rental (surcharge), Snack Bar, Bar, Breakfast in the Room, Room Service, Mini Bar. Best accommodation in close proximity to the Zenska plaža beach. L & I Apartments – This property is 2 minutes walk from the beach. Featuring free WiFi and barbecue facilities, L & I Apartments offers rooms in Ulcinj, 1 kilometer from Old Town Ulcinj and 3.7 kilometer from Velika Plaza beach. Featuring a garden, the 4-star bed and breakfast has air-conditioned rooms with a private bathroom. The bed and breakfast provides sea views and a children’s playground. At the bed and breakfast, all rooms include a desk. All units feature a wardrobe. Staff are available to help at the 24-hour front desk. Location – 500 meters from the city center of Ulcinj. Facilities : Garden, Outdoor furniture, BBQ facilities, Massage (Additional charge), 24-hour front desk, Wake-up service, Luggage storage, Airport shuttle (additional charge), Grocery deliveries, Daily maid service, Ironing Facilities, Air conditioning, Free Wi-Fi, Free parking. It is a natural phenomenon of beauty and abundance. It is 5 kilometer away from Ulcinj, 13 kilometer long, 60 meter wide, so the locals call it “Kopakabana of Ulcinj”. It spreads out from Djerane Cape to Ada Bojana. It is covered with the finest sand (the diameter of a grain is 0.1-5mm) and it is estimated that its capacity is 15000 people. The quality of the sand is such that is has medicinal features. It is rich with minerals, it is good for those suffering from rheumatism and other illnesses. The Velika plaža is distinctive for a long shallow belt of sea water. A 100m away from the sea there is a hotel complex with terrains for tennis,football, baseball, volleyball, handball in the background of the Velika plaža. It is rich with subtropical, Mediterranean and decorating plants. Beneath the Djeran Cape, at the very beginning of the Velika plaža there is a marine Porto Milena, deeply pulled in the dry land. There are numerous wooden keels built for fishing in a traditional way, called “kalimera” by the locals. Various sport equipment can be rented at the beach. You can sail, surf, water ski, play football or volleyball on the sand, or just recreate. Best accommodation in close proximity to the Velika plaža beach. Perla Hotel – Located 500 m from Velika plaža in Ulcinj, Perla Hotel features free WiFi access and free private parking. The hotel has a children’s playground and terrace, and guests can enjoy a meal at the restaurant. The rooms have a flat-screen TV. Certain units include a seating area to relax in after a busy day. Some rooms have views of the sea or mountains. The rooms are equipped with a private bathroom with a bath and shower, with slippers and free toiletries provided. A TV with satellite channels is offered. You will find a 24-hour front desk at the property. Location – Velika plaža, 2 km from the center of Ulcinj. Facilities : Outdoor furniture, Terrace, Balcony, Garden, Private beach area, Coffee machine, Electric kettle, Restaurant (buffet), Breakfast in the room, Bar, Minibar, On-site coffee house, Free Wi-Fi, Free parking, Airport shuttle (additional charge), Swimming pool, Sauna, Wake-up service, 24-hour front desk, Safety deposit box, Ironing service (Additional charge), Laundry (Additional charge). Many people consider Ada Bojana to be a natural reservation of national park type. This is a river isle, at the very end of Velika plaža, at the spot where the river Bojana gets separated from the beach. The isle is a triangle, with the Bojana River from two sides and the Adriatic Sea from the third one. This side is a sandy beach, 2880 meter long, with the capacity of 13000 people. The beach and the sea bottom are covered with fine sand. There are parasols made of reeds and rods on the beach. Ada is the most beautiful in sunset-when the incredible dance of colours starts creating a unique picture of the sea, sand and the sky. It is a heaven for windsurfing, sailing, water-skiing, beach riding, for all the adventurers and lovers. The beaches that are pounded by Bojana river are famous for wooden houses, from where the local people fish in a traditional and specific way. You can taste the fish in the restaurants which are also built in an attractive environment. There are a lot of subtropical and Mediterranean vegetation, and some plant species are unique in Europe. Best accommodation in close proximity to the Ada Bojana peninsula. Vila Lepa – Located 13 kilometer from the Old Town of Ulcinj, Vila “Lepa” offers a private beach and free WiFi. All units have a terrace with sea views and a kitchen with oven and refrigerator. Some units are air-conditioned and include a seating area with a TV. The apartment also has a terrace. Facilities : Free Parking, Terrace, Private Beach Area, BBQ Facilities, Free Wi-Fi Internet Access Included, Canoeing (surcharge), Windsurfing (surcharge), Fishing (surcharge), Sea View, River View, Ironing Facilities.